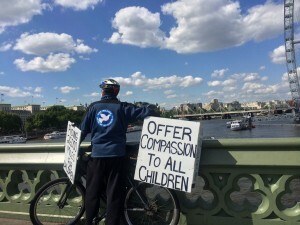 Today I changed the front sign on the Kindness Bicycle to read: “Riding 26,000 miles for children,” and the one of the side signs to read: “Offer compassion to all children.” The people came out of the woodwork today. A few groups clapped …horns honked…people were giving me thumbs up before I did to them… I was invited into pubs for a pint…dozens of people posed with me…hundreds of conversations…huge huge huge day!!! This entry was posted on Thursday, June 5th, 2014 at 9:33 am	and is filed under Kindness. You can follow any responses to this entry through the RSS 2.0 feed. You can leave a response, or trackback from your own site.